Vaux-le-Vicomte, the French Baroque château that inspired Louis XIV’s palace of Versailles, has long stood without the monumental fresco planned by Charles Le Brun for its great hall. The 17th-century artist and interior decorator of the vast estate in Maincy, south-east of Paris, was about to start painting the domed ceiling of the grand salon when his patron, the King’s finance minister, Nicolas Fouquet, was arrested for treason and embezzlement in 1661. Fouquet underwent the “trial of the century” and died in prison 20 years later, while Louis XIV hired his architect, Louis Le Vau, landscape gardener André Le Nôtre and Le Brun to work on his own, even grander palace at Versailles. Vaux-le-Vicomte passed through the hands of several aristocratic families before it was purchased and restored in 1875 by the sugar magnate Alfred Sommier. His descendants, who opened the estate to the public 50 years ago, are now turning to digital technology to recreate Le Brun’s never-realised masterpiece, The Palace of the Sun. The artist “had made several preparatory drawings, even a small maquette, and [Gérard] Audran made an engraving of the most complete preparatory drawing”, says Ascanio de Vogüé, Sommier’s great-great-grandson, who manages Vaux-le-Vicomte today with his brothers Jean-Charles and Alexandre. This is all that remains of a complex, mythological composition that “would have been one of the most dazzling and majestic paintings of the French classical Baroque”, De Vogüé says. An enlarged reproduction of Audran’s engraving is currently on display in the grand salon. The family has hoped for years to complete Le Brun’s vision at life size on the ceiling, which was covered in 1830 with a simple fresco of a sky with an eagle in flight. But the original structure cannot be modified or removed, since Vaux-le-Vicomte is classified as an historic monument of France. 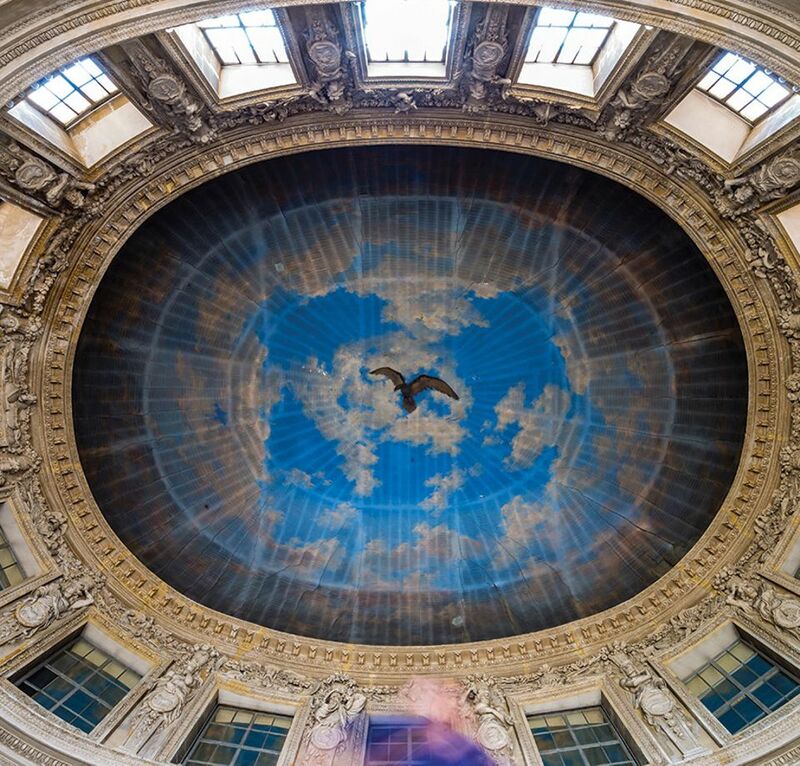 An earlier idea to install a false ceiling, similar to that decorated by the Modern artist Marc Chagall at the Opéra Garnier in Paris, was rejected as “too complicated, too onerous”, De Vogüé says. Video projection mapping technology now offers a “reversible” solution. The existing fresco will be cleaned and restored, while art historians will study Le Brun’s plans in the context of the decorative scheme for the grand salon. “Under their guidance, we will start working with creatives to develop the design with colour and movement,” De Vogüé says. He hopes that the resulting projections, on a loop of a few minutes, will show Le Brun’s red chalk drawing evolving into a fully fledged painting, and finally an animation. Two hurdles remain: daylight and funding. Powering the digital display during the château’s main opening hours would require 30 projectors—“impossible in terms of space and funds”, De Vogüé says—and blacking out the windows “would be a heresy”. The initiative could be restricted to the candlelit “nocturnes” events on Saturday evenings between May and October, “but we haven’t yet stopped our research to make it possible during the day”, he says. As France’s largest privately run historic monument, Vaux-le-Vicomte gets only a tiny percentage of its income from public subsidies. In its 50th anniversary year, the château has launched a €6m fundraising campaign, Vaux-le-Vicomte 2020, to finance the Le Brun project, as well as annual exhibitions, ongoing maintenance and a 3D audio system that will immerse visitors in the château’s tumultuous history. An estimated €900,000 is needed to restore the grand salon, while the digital projections will require €750,000. The deadline for donations is the end of 2019, De Vogüé says, so the technology can be installed over the annual winter break, before the château reopens in spring 2020.